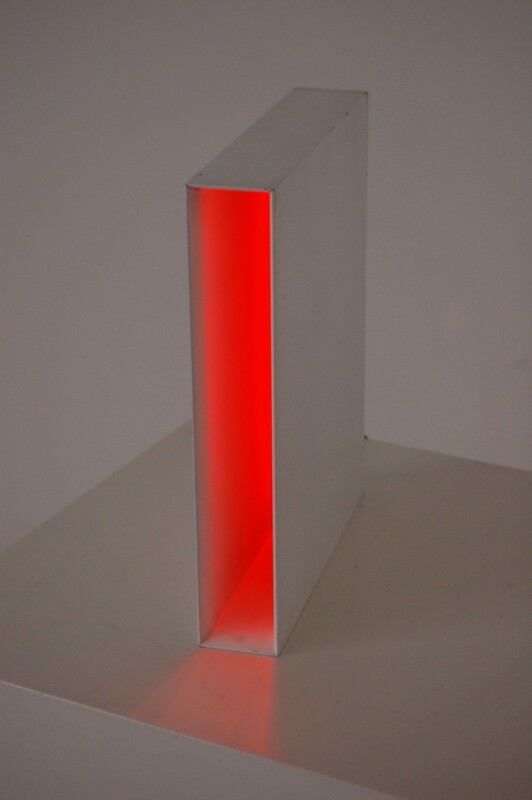 Book sized sculptures, internally illuminated. Installations at Richard Salmon Gallery, 1997; Charlotte Street Hotel, London (permanent) and private residences. I have often spoken about my work creating spaces that can only be imaginatively occupied and how that can be analogous to the space we create for ourselves when absorbed with a novel. We may ‘see’ the spaces described in our mind’s eye, as they say, until the spell is broken when our attention is distracted. In 1997 the painter and writer Joan Keys included me in an exhibition at Richard Salmon Gallery in Kensington in London. 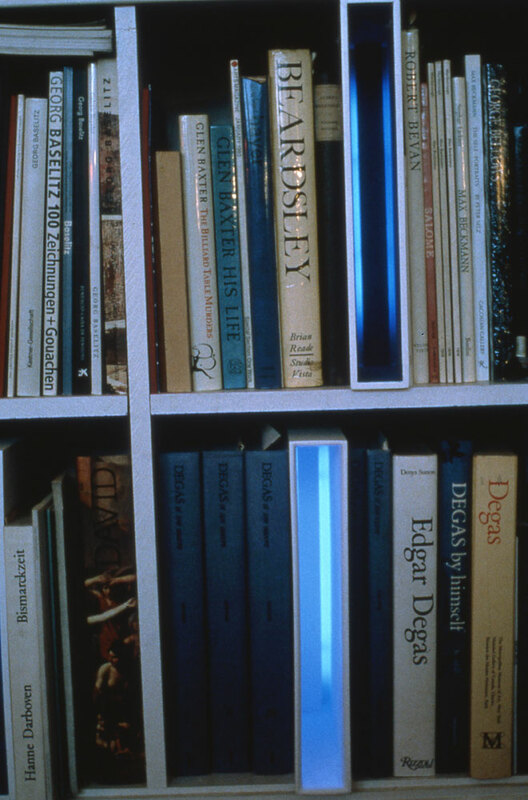 When I viewed the spaces, which were originally artist’s studios, I noticed that one of the galleries had low-level bookshelves running all the way around two of the walls. It became an engaging idea to create a work that only occupied the physical space of a book, but would allow for the imaginative engagement I sought. There are two basic formats, one is emitting and has white interior, the other more absorbing of light and has a flocked interior. 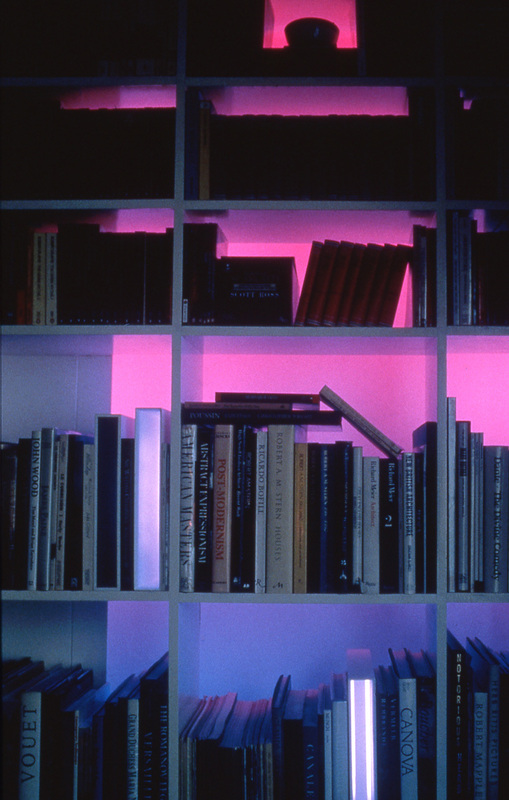 The ‘Book Spaces’ have led to commissions involving whole book shelf installations, which can have an interactive quality, as books are added or removed, affecting the shapes and emittance of light.